In the early years of the Pre-Raphaelite Brotherhood, artist Walter Deverell discovered Elizabeth Siddal working in a millinery shop. After modeling for his painting Twelfth Night, Siddal posed for several Pre-Raphaelite painters, including William Holman Hunt and John Everett Millais. It was the artist Dante Gabriel Rossetti who was most captivated by her. He drew and painted her image obsessively. 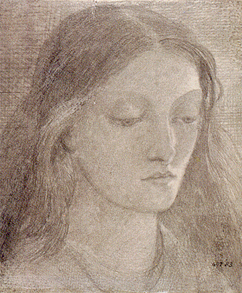 Siddal represented the ideal beauty to him as if she were an embodiment of Dante Alighieri’s Beatrice, and Rossetti eagerly cast her in that role. He tutored her in art and she began what seemed to be the beginning of a promising career. Their relationship was tumultuous, however, and Rossetti’s flirtation with model Annie Miller and his dalliance with Fanny Cornforth wounded Siddal. They married in 1860 after a decade-long on/off romance. A stillborn daughter plunged Siddal into a state of deep depression and she sunk further into her addiction to laudanum. In February of 1862, she died of an overdose. The grieving Rossetti placed his manuscript of poems in her coffin. Seven years later he had her exhumed in order to publish them. Elizabeth Siddal’s features appear in ‘Beata Beatrix,’ Dante Gabriel Rossetti’s tribute to his wife after her death. It was Charles Augustus Howell who orchestrated the exhumation. Howell has since achieved fame by being cast as a villain in the Sherlock Holmes story The Adventure of Charles Augustus Milverton. Howell was a notorious liar and fraud. We have him to thank for the story that when Elizabeth Siddal was exhumed, she remained in pristine condition and her famous hair had continued to grow after death. It has become one of the most famous stories about Siddal, next to her falling ill while posing for Ophelia. When we look at the story that her body resisted decomposition, we have two choices. One, we can believe that this was an unusual phenomenon or, two, that Howell lied. I choose to believe the latter. With ample proof that Howell was almost pathologically dishonest, it is probable that Howell embellished Siddal’s appearance with this fantastic tale. His motivations remain unclear. Perhaps it was an ego boost to be the bearer of such an eerie anecdote. He may have wanted to thrill or tantalize Rossetti, who was known to be inspired by the supernatural and had attempted to contact Siddal through seances. The most likely reason was to gloss over the ugliness and to assuage Rossetti’s guilt, for if he believed Siddal remained perfect, then exhuming her was not an unpleasant disturbance and she was at peace. Whatever his motive, when Howell said that Siddal had not decomposed, he constructed the legend that is now firmly attached to her name. Elizabeth Siddal in Rossetti’s painting ‘Regina Cordium’ (Queen of Hearts) begun by the artist while on their honeymoon. Elizabeth Siddal’s name is now surrounded by the aura of tragedy. The lines of fact and fiction have become blurred due to sad events of her life and the fact that many works she posed for have an uncanny aspect to them. There’s a sense of life imitating art in the lives of both Elizabeth Siddal and Dante Gabriel Rossetti. 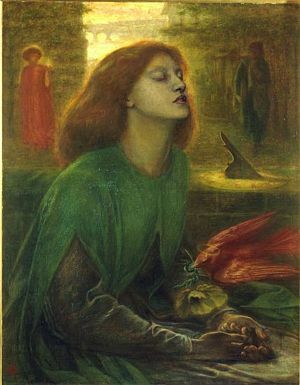 Rossetti often incorporated elements of death in works like The Blessed Damozel and the study for Bonifazio’s Mistress. The Blessed Damozel, written before he met Siddal, tells the story of lovers separated by death. Siddal was not the inspiration for the work, yet due to her untimely death, it is easy for us to see her as the departed lover in heaven. Rossetti’s doppelganger painting How The Met Themselves also lends a ghostly air to the way we view their relationship. Elizabeth Siddal’s surviving poems have a melancholy tone, which adds even more sadness to her story if we read them as autobiographical (I don’t endorse that, by the way). 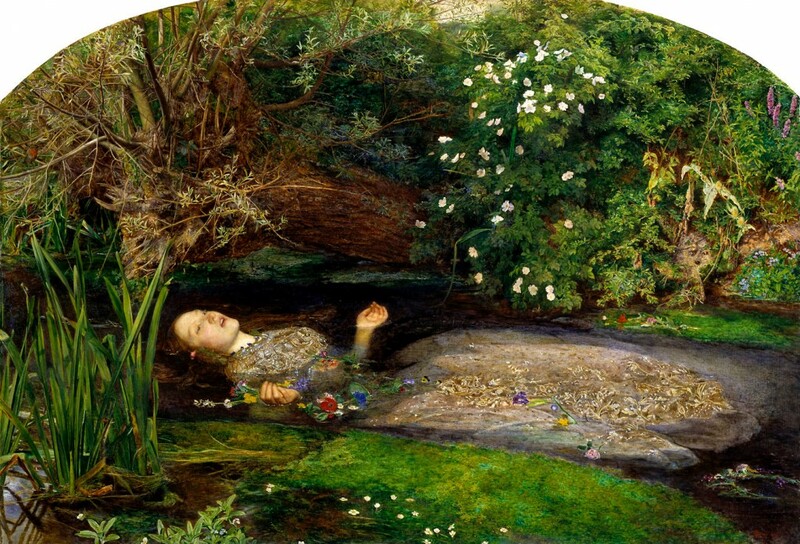 She is also strongly associated with the character of Ophelia; she appears in Millais’ famous painting of the drowned Shakespearean maiden. Viewed only through their collective works, it appears as if an atmosphere of death surrounded the couple, foreshadowing what was to come. Yet Elizabeth Eleanor Siddal was not a phantasm, neither was she Ophelia. None of these images are a reflection of her true self, but they create an ersatz form to which we attach meaning. 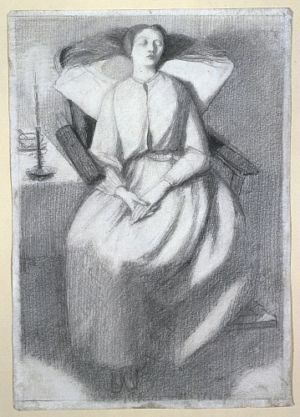 Since there is a tendency to focus on the supernatural elements associated with Siddal, she is commonly viewed as a ghostly figure more than a real woman. As this sort of shadow figure, it becomes easy to project rumor and myth onto her and accept them as true. One of the ideas that persists is that she was the inspiration for the character of Lucy Westenra in Bram Stoker’s Dracula. Some even take it so far as to claim that Stoker was present at Siddal’s exhumation, an impossibility since when the deed took place Stoker was twenty-two and still a student living in Dublin. So the notion that Stoker was at the exhumation is easily debunked. But what about the claim that Siddal was an inspiration for the character of Lucy Westenra? Lucy Westenra (Sadie Frost, left) and Mina Harker (Winona Ryder) in the 1992 film Bram Stoker’s Dracula. I think it is possible. 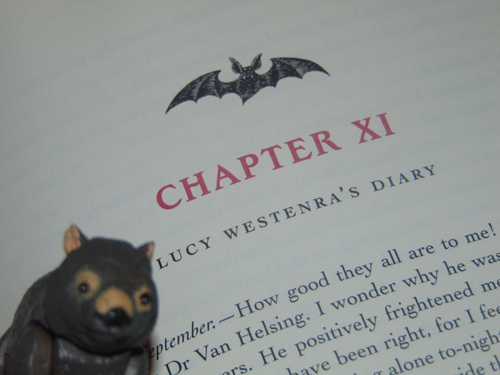 In his notes made while working on Dracula, Stoker never mentioned the Rossetti/Siddal incident, so we can not definitively confirm that Lucy Westenra was inspired by Siddal. However, Bram Stoker lived in the same neighborhood as Rossetti and he was a friend of Hall Caine, who at one time was Rossetti’s secretary. 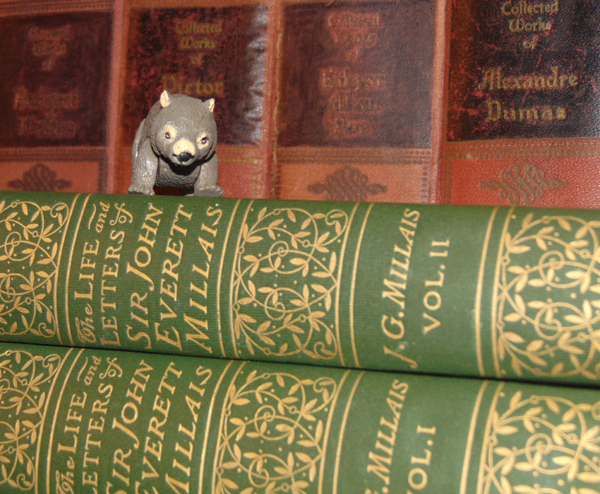 Stoker dedicated Dracula to Caine, with a nickname used by Caine’s grandmother (“to my dear friend Hommy-Beg”). Stoker may not have included the story of Siddal’s exhumation in his notes, but due to his closeness with Caine he had to have heard an account of it at some point and he had probably read Caine’s book Recollections of Dante Gabriel Rossetti (1882). The belief that Stoker used Siddal as inspiration is bolstered by his 1892 short story The Secret of the Growing Gold. The ‘growing gold’ is the hair of a dead woman, the very tresses that had been her most striking feature in life. Her hair grows persistently and with a purpose; her intent is to haunt her husband and avenge her own death. The similarity between Stoker’s story and the claim that Siddal’s hair continued to grow and fill her coffin after death is unlikely to be a coincidence. Elizabeth Siddal as Ophelia, painted by John Everett Millais. See Ophelia’s Flowers and The lure of water-women. Hair that grows even in death. Beautiful women who wasted away and died. Allusions to Ophelia. 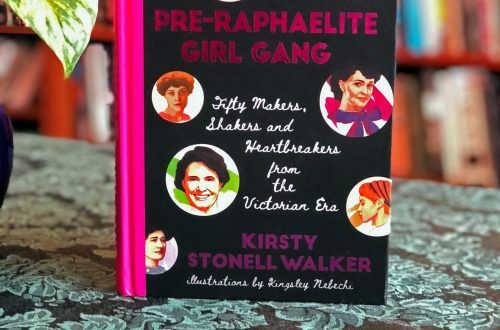 It is easy to understand how connections between Elizabeth Siddal and Lucy Westenra are made. Charles Augustus Howell inadvertently created Elizabeth Siddal as the undead and his lie still carries weight. Siddal has ceased to be herself where popular culture is concerned. In life, she was Dante’s Beatrice. In death, she is a creation similar to Poe’s Ligeia. She is Ophelia or Lucy Westenra. She is never just herself. Bram Stoker’s famous book is not the only vampiric connection that can be made when looking at Elizabeth Siddal. 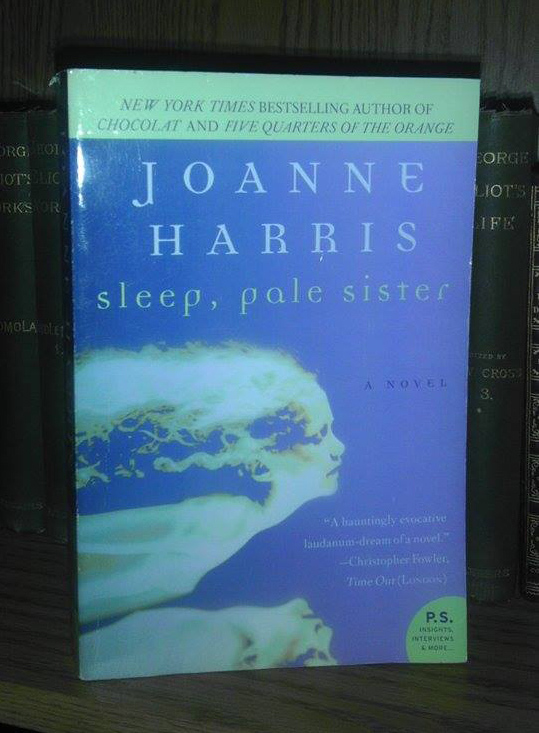 Searching for vampires, we need look no further than her husband’s family tree. Dante Gabriel Rossetti was the nephew of Dr. John Polidori, author of The Vampyre (1819). This family connection was used creatively by Tim Powers in his novel Hide Me Among the Graves (2012), where the entire Rossetti clan fights off their late uncle Polidori, the vampire that plagues their family. Powers uses Siddal’s exhumation as a plot device. 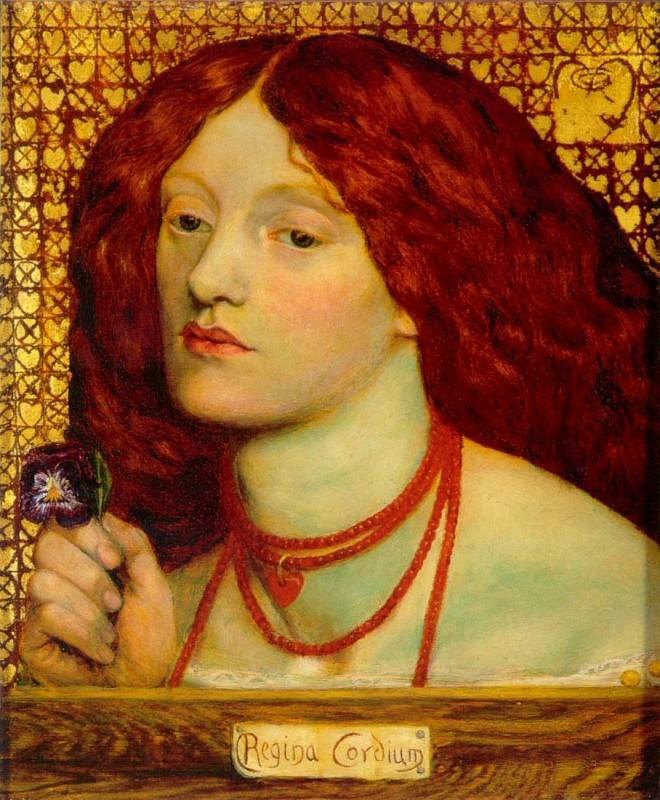 Rossetti’s choice to dig up his late wife was such an unsettling thing to do that, even over a century later, the act is still inspiring fictional works. Rossetti’s sister, poet Christina Rossetti, wrote the poem In An Artist’s Studio that is assumed to be about Elizabeth Siddal. The language Christina Rossetti uses is evocative. He feeds upon her face by day and night. The poem emphasizes the woman’s passivity while serving as the artist’s muse. The poem was composed in 1856, although not published until after the poet’s death. Since it was written well before the death and exhumation of Elizabeth Siddal, the similarity of the artist feeding upon his muse as a vampire feeds upon his victim is unintentional. Yet it is an excellent example of how the language used to describe Siddal helped to create this impression we have of her as a wraith-like figure. After Ford Madox Brown called upon Rossetti and Elizabeth Siddal one evening, he recorded in his diary, “Saw Miss Siddal, looking thinner and more deathlike and more beautiful and more ragged than ever; a real artist, a woman without parallel for many a long year.” She’s referred to as if she is an interstitial figure, hovering somewhere between life and death. We can be dismissive of vampire tales and supernatural accounts of Siddal’s hair because logically we know these things are untrue. Yet it isn’t that simple. 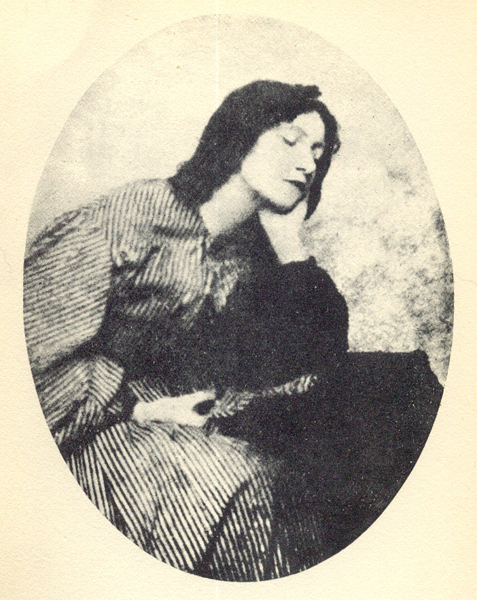 Elizabeth Siddal, the true Elizabeth Siddal, is lost in all the drama. Fictional accounts of her, such as the 2009 BBC production Desperate Romantics, miss the mark. Can we justify weak characterizations of Siddal simply because they might introduce more fans to Pre-Raphaelite art? 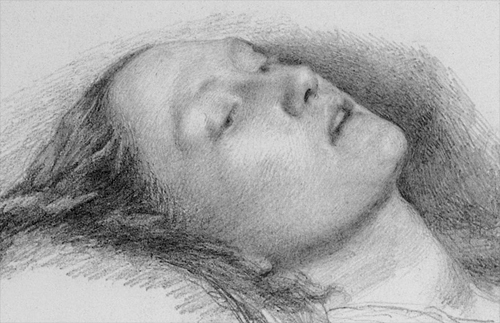 Should Elizabeth Siddal be overlooked because the myths we have projected onto her are more provocative? These fantastic stories have become so attached to her name that in order to deconstruct them, we have to acknowledge and understand them. We have to root out their sources, ponder how they came to be, and what they mean. In order to focus on her life and work in a straightforward way, we have to dive in head-first and slay the myths. In doing so, we stand a chance of understanding the difference between Elizabeth Siddal the construct and Elizabeth Siddal the actual woman. That’s a project worth undertaking.